Transform unwanted beliefs and Healing with Gongs! 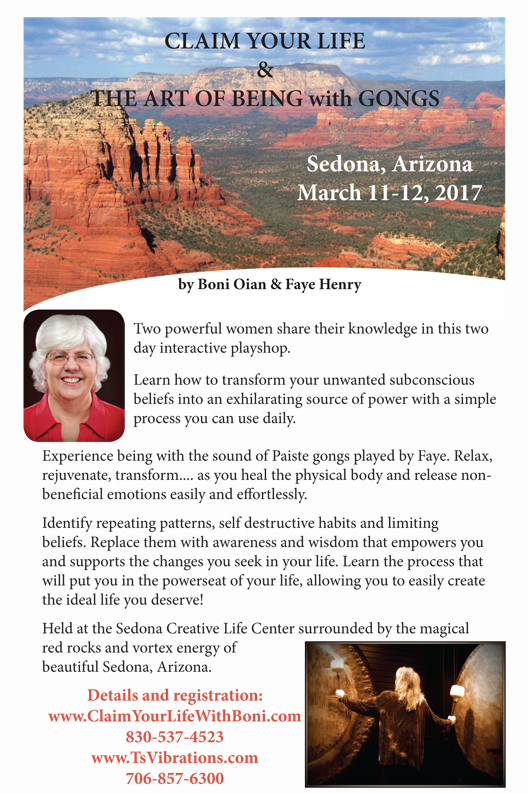 All in a TWO-DAY Interactive workshop with Boni & Faye At Sedona! Have you ever wondered about your own subconscious thoughts , and how they have been lurking around ? Have you wondered if they work AGAINST your goals, your dreams, your desires or are they working FOR you, in the direction towards your goals/dreams/desires ? Do you know there is simple method to transform those very unwanted thoughts into what can be used to fuel your goals/dreams/desires? I bet most of us have listened to music – we should be no stranger to this sound. Would you like to experience how Gongs can aid in relieving some of the unhealed trauma ( easily, effortlessly) ? Well , you are in luck! These 2 ladies, Boni Oian and Faye Henry are among the folks who I was grateful to, and they have decided to hold a 2 day workshop next year in Sedona, Arizona next year. Feel free to drop them an email ( click here or here ) or drop me an email to inquire more! I love to see more people fulfilling their dreams, potential and creativity in their own life ! And feel free to share them with folks / friends/ colleagues who could benefit from the information and workshops!